David Brodsky has moved on, but many of his decisions made while he was Chief Executive at the Office of Labor Relations, are very interesting - at least to readers of this blog. Rumor has it that he is at Montefiore Medical Center in the Bronx. In any case, the below decision written - or at least signed - by David Brodsky says some interesting things about secret recordings and what constitutes harassment of teachers. 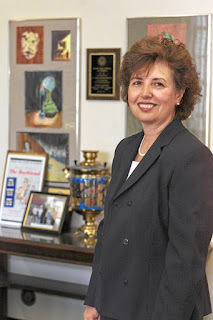 The Special Complaint was filed by 20 teachers at Bronx Science, including Chalkbeat writer Peter Lamphere, who claimed that in 2008 Assistant Principal Rosemarie Jahoda repeatedly harassed them. They also charged that principal Valerie Reidy wrongly denied them tenure and gave arbitrary “U” ratings. See also a 2012 PERB charge of bad faith against the UFT for your summer enjoyment. In many ways I already miss David, with whom I met many times at Tweed and at 49-51 Chambers Street, 6th Floor. He was always diplomatic in what he said and acted completely as a gentleman at all times, even when he disagreed with what was being said. Good luck in your new position, Mr. Brodsky! 4. Finding a room in which to speak with my clients hoping that Sylvia would not suddenly barge in and tell us to immediately get out, as the rooms on the 6th floor belong to the NYC Department of Education, and we don't work for the DOE. Huh? My clients are all DOE employees....I guess she forgot. I will add to this list as more funny incidents come to mind. There are a lot of them. In accordance with Article 23 ("Special Complaints") of the collective bargaining agreement ("CBA") covering teachers employed by the Department, I have been duly designated to issue the final Department determination in the above-referenced matter. Upon consideration of the Fact Finder's Report and Recommendations ("Report")1 dated April 15, 20102 in this case, I am issuing this letter as the Chancellor's determination under Article 23G of the governing CBA. In sum, the Department has determined to reject the Report in all respects, except as expressly stated otherwise below. Upon review of the available record including the same surreptitious audio recording that was submitted to the Fact-Finder, I conclude that the Report is not fairly based upon all the evidence in this case. Equally important, the Report did not address major legal arguments or apply governing legal principles in this case and is thus fundamentally flawed. My review of the Fact-Finder's Report is in accordance with the declared objective outlined in the preamble of the Special Complaints section of the CBA. This process is designed "to encourage prompt and informal resolution of special complaints not covered by the grievance procedure ..." Thus, I agree with the Fact-Finder to the extent she concluded that pedagogical issues or matters involving the implementation of department/school policies or procedures, assignments, postings, or disciplinary matters are inappropriate for the Special Complaint procedure. See Report, p. 2. Any challenges the union seeks to present involving these issues must be lodged in other forums, whether under available CBA grievance procedures such as the reorganization grievance process; the separate non-contractual processes for review of pedagogical ratings and discontinuances; or elsewhere. Thus, after listing six categories of issues the Special Complainants sought to raise in this matter, the Fact-Finder noted that only one such category, i.e., alleged "creation of a hostile work environment through the harassment and intimidation of teachers, particularly untenured teachers" was "at the heart of the matter." Report, p. 2. The remaining issues represented disagreement over pedagogical matters that are inappropriate subjects for determination in a Special Complaint proceeding. As to the issues considered by the Fact-Finder, I completely reject her conclusions that Assistant Principal Rosemarie Jahoda3 harassed "certain teachers, including but not limited to Elizabeth Bellantoni, Carolyn Abbott, and Nancy Phillip" and that "in addition to specific acts of intimidation ... the totality of Jahoda's treatment of teachers also constitutes harassment." Report, p. 7. I note that, as recognized by the Fact-Finder, Principal Valerie Reidy identified the Mathematics Department as needing improvement in academics and being student centered. In her attempt to address its deficiencies, Principal Reidy hired Ms. Jahoda as the school's assistant principal for math department in August 2007. At Principal Reidy's suggestion, Assistant Principal Jahoda focused her efforts to provide instructional support to six newer teachers to the school. Report, p. 3.4 Instead of being open to her directions, a group of the newer teachers resisted Assistant Principal Jahoda's instructions and sought the assistance of the more senior members of the math department, who had mentored them prior to Assistant Principal Jahoda's arrival at the school. The record further shows that the more senior teachers were also resistant to change and supervision themselves and often treated Assistant Principal Jahoda, herself a new supervisor, with rudeness and disrespect that at times became extreme. 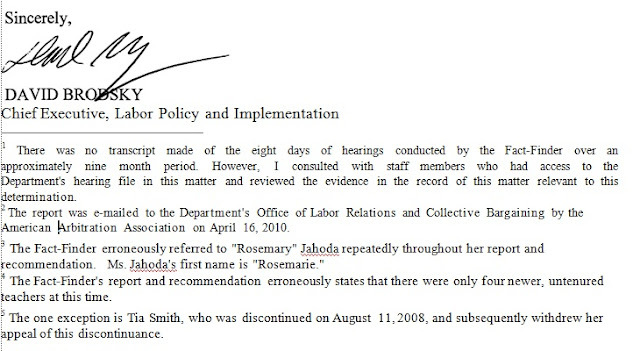 The Fact-Finder appears to largely justify her conclusions regarding Assistant Principal Jahoda's tone and manner in her dealings with the teachers based on the testimony of three teachers; various unsworn written statements submitted by other special complainants; and, most significantly, on a surreptitious audio recording introduced by the union on its rebuttal case. Union Exhibit 21. In fact, as evidenced by the Report's Fact-Finding discussion devoted to this surreptitious recording, there can be no doubt that it was heavily relied upon by the Fact-Finder. Accordingly, I also reviewed this recording and have concluded that it was unfairly considered for more than the limited purpose for which it was offered but, in any case, does not support the Fact-Finder's conclusions. In fact, the recording shows, in context of the entire record, that teacher Nancy Philip wanted to have a fellow teacher accompany her to a post-observation conference with Assistant Principal Jahoda. However, there is no contractual right for such an arrangement regarding a non-disciplinary conference such as the post-observation meeting in question. Further, Assistant Principal Jahoda was confronted by a group of teachers who suddenly appeared on the scene, and Ms. Jahoda felt it necessary to call the Principal for assistance. Thus, while it is not surprising that Assistant Principal's "tone with the teachers was confrontational and defensive and, at times, her voice was raised," see Report, p. 5, this is hardly evidence of harassment of the teachers. More accurately, the recording shows that a group of teachers walked into the meeting to challenge and intimidate a new Assistant Principal. Even accepting the finding of the Fact­ Finder concerning that Assistant Principal Jahoda's tone and manner, such behavior does not rise to the level of harassment under the parties' contractual complaint process. See UFT v. Board of Education, (Dr. Arlene Bloom), AAA# l339 0515 88, Arbitrator Weinstock (1988) pp. 18-19, which held that a principal's impatience and annoyance, even though it exceeded the bounds of propriety, did not rise to the level of harassment or discrimination. the Department's attorneys maintained that, under governing case law reflecting principles of fundamental fairness, an adverse inference should be drawn by the Fact-Finder that no alleged incident of verbal harassment rose even to the level of the one recording submitted, and even that did not demonstrate harassment. See supra. However, the Report does not address this point in any way. I thus draw the inference that the withheld audio recordings do not establish harassment any more than the one secret recording that was submitted, which itself does not establish harassment. Accordingly, I reject any of the Fact-Finder's determinations to the contrary. Moreover, the Fact-Finder's Report is fundamentally flawed in that it fails to consider all relevant facts regarding a number of other conclusions. For example, I reject the Fact-Finder's conclusions that requiring teachers to raise their hands before speaking at Departmental meetings is harassment or meant to intimidate. See Report, p. 4. To the contrary, the full record shows that the Mathematics Department meetings were particularly disorderly and chaotic with individuals frequently speaking over one another. The Assistant Principal took steps to bring some order into chaotic meetings. Further, in finding that Assistant Principal Jahoda reduced teachers to tears, she misstated the number of teachers who allegedly cried and, more to the point, overlooked all the relevant circumstances. For example, the Fact-Finder overlooked the fact that Assistant Principal Jahoda was herself concerned during her first ever post-observation conference when Special Complainant Philip broke into tears while Ms. Jahoda was attempting to critique the lesson taught by Philips. At no point was it alleged that Ms. Jahoda's critique was delivered in any way but the most professional and respectful manner. When that occurred, Assistant Principal Jahoda gave Philip tissues; assured her the lesson observation would be rendered null and void and not placed in her file; attempted to comfort Philip; and allowed the meeting to end. These are hardly the hallmarks of harassment. Moreover, the Fact-Finder does not address various acts of insubordinate and rude conduct by the Special Complainants, . Special Complainant Veetal's admission that she raised her voice and used obscenities when addressing Assistant Principal Jahoda. In addition, the Fact-Finder evidently credited unsworn written statements by numerous Special Complainants over sworn testimony and written affidavits, themselves prepared in response to the unsworn statements. Among other things, these affidavits included those from non-complaining teachers who corroborated Assistant Principal Jahoda's testimony that she did not raise her voice or harass teachers at meetings and at other times. I find that, to the extent the Fact-Finder credited unsworn statements over sworn testimony and affidavits, she committed a fundamental evidentiary error reflecting on the soundness of her conclusions. However, it would serve little purpose to further catalog here the numerous similar ways the Report is fundamentally flawed. Suffice it to say that I cannot find that it portrays an accurate, fair and complete picture of the relevant events, nor can I adopt most of the conclusions she has drawn from the incomplete factual picture portrayed in the Report. Finally, the evidence illustrates that Principal Reidy made numerous good faith attempts to reach a resolution. During the four months between the date the special complaint was drafted and the date it was filed, the union district representative and school's chapter leader knew that the principal and assistant principal were being secretly recorded, which adversely reflects on the good faith of their efforts to work with the Principal to resolve the matter. Thus, it would be an injustice to find that the Principal did not do all within her power to afford "adequate relief," even assuming for the sake of argument that any harassment occurred. 1. The first recommendation is rejected. The Chancellor does not have the ability to require voluntary and simultaneous transfer of pedagogical staff. Moreover, given my rejection of the Fact-Finder's findings and conclusions above, I do not agree that it is appropriate for Assistant Principal Jahoda to leave her position at the Bronx High School of Science. 2. The second recommendation is rejected. Procedures involving letters placed in the files of the complainants are beyond the scope of the Fact-Finder's jurisdiction. 3. The third recommendation is adopted, in part. Team building programs, to the extent there are available funds not needed for direct educational support, are often salutary. Thus, I will support Principal Reidy to the extent she chooses to engage the services of an experienced facilitator to work with the Mathematics Department and the administration to establish mutual goals and to build a cohesive unit. The Bronx High School of Science must overcome the disruption caused by this proceeding and begin the healing process. 4. The fourth recommendation is rejected. The Fact-Finder's recommendation is unclear as to "actions affecting" teachers who transferred from the school. Only two of the complainants, Shahom and Bea Robertson, have "transferred" out of the school as outlined in the collective bargaining agreement. All other complainants have who are no longer at the Bronx High School of Science have either retired or resigned.5 Moreover, it appears that the recommendation would affect actions that are not within the jurisdiction of a Special Complaint Fact-Finder. Based on the foregoing, I reject the Fact-Finder's Report and Recommendations except as expressly stated otherwise above. Embattled faculty members at Bronx High School of Science are rejoicing after a state judge ruled to erase an unsatisfactory rating from a former teacher’s record. In a decision last Wednesday, Manhattan Supreme Court Justice Paul Feinman granted a petition to overturn a “U”-rating for Peter Lamphere, which he received from principal Valerie Reidy during the 2008-09 school year. The former union chapter leader appealed it first to the Department of Education, and then to the court, in July. Lamphere was among 20 out of 22 math teachers who filed a special complaint in 2008 against assistant principal Rosemarie Jahoda, alleging repeated harassment. They also charged that Reidy wrongly denied them tenure and gave arbitrary “U” ratings. An independent investigator found that the teachers were being harassed. Lamphere, a tenured teacher, decided to leave Bronx Science after receiving two “U” ratings from Reidy, the first in the 2007-08 school year and then again in the 2008-2009 school year. “It was understood at Bronx Science that Reidy used ‘U’ ratings and denials of tenure for nonpedagogical reasons,” said Mark Kagan, a social studies teacher who left the school this year. Lamphere said he is still awaiting another judge’s decision for his first negative evaluation. Last week’s ruling will likely grant Lamphere the wages he did not get when he received the poor rating. Reidy did not return repeated requests for comment. “We are disappointed in the decision and are weighing our legal options,” said DOE spokeswoman Barbara Morgan. Lamphere said the ruling should provide encouragement to other teachers.